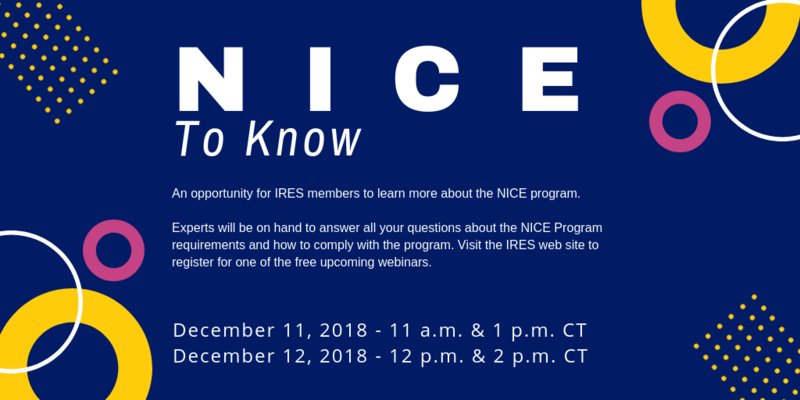 The NICE to Know webinar is a great opportunity for IRES Members to learn more about the National IRES Continuing Education (NICE) Program. Experts will be on hand to answer any and all of your questions regarding the NICE Program requirements and how to comply with the program. Click on the registration link to register for one of the free upcoming half-hour webinars. While there are four, half-hour sessions scheduled. The basic content of each session is identical. Webinar log in instructions will be sent once you complete the registration process. NOTE: This event does not qualify for continuing education credit under the NICE Program. IRES members who have earned the right to put AIE®, CIE®, or CICSR® after their names also must take part in an ongoing program of continuing education also known as the National IRES Continuing Education (NICE) Program. This program was established to assure the continuing integrity of the three designations by establishing minimum continuing education standards for those Society members who have earned and choose to maintain their IRES designations. The NICE Program seeks to ensure that every active designee holder pursues a plan of continuing education throughout his or her career to remain current with issues facing the insurance industry. IRES recognizes and endorses only those designees who are members in good standing and comply with the program on a continuing basis. A designee must remain as a dues-paying member of IRES to be a member in good standing. The NICE Program requires 15 hours of qualifying continuing education credit to be earned and reported each year. The rules for qualifying programs were designed to ensure substance and quality, but at the same time allow the maximum flexibility to attend a wide range of educational opportunities, including those with nominal cost.